On Sunday, January 22, 2012, the Radical Feminists of Occupy San Diego are hosting the Roe v. Wade Anniversary Abortion and Reproductive Rights Rally, March, and Speak-Out. A rally with speakers will be held from 1-1:30 in the Civic Center Plaza (or Freedom Plaza – nicknamed by Occupy San Diego), followed by a march downtown and an open-mic speakout. The event is to commemorate the 38th anniversary of the landmark U.S. Supreme Court decision, Roe v. Wade, which legalized abortion on a federal level in 1973, and to protest the many restrictions on abortion rights and access. Since abortion was legalized, women’s right to choose abortion has come under a multi-pronged attack from the right wing and the corporate elite. 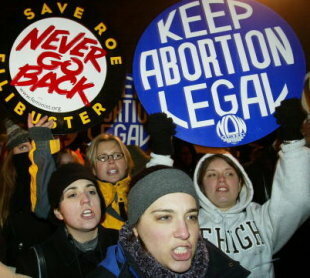 Legal restrictions on abortion; violent attacks on abortion providers, including bombings of clinics and assassinations of doctors; a vast reduction in the number of abortion providers nationwide; and defunding abortion coverage have caused women’s health to suffer, taken away the right of women to have autonomy over their own bodies and lives, and directly caused many maternity-related deaths. The majority of people harmed by these attacks on abortion and reproductive rights are impoverished women and women of color. Abortion is a part of comprehensive health care, and health care is a right, not a privilege. The Radical Feminists stand in solidarity with all women and demand that abortion be provided for free, legally, safely, and without restrictions. San Diego Radical Feminists is a group that sprang up out of Occupy San Diego with an intention of increasing women’s participation in Occupy San Diego & helping build a feminist movement. We gather to take actions, share our stories, and educate each other. Older Article: Occupy Wall Street Descends on Congress, Says: Money Out of Politics!